Forest Technology alum Billy Kunelius shares his story about choosing the Thompson School, getting to know his faculty, gaining hands on experience and landing a job with a company he interned with while here at Thompson School. After working for four years after graduation from high school, I was ready to further my education. As I pondered my options of schools and degrees, forestry came to the forefront, and not only forestry, but forestry at the Thompson School of Applied Science. Growing up in an outdoor environment, I spent much of my time roaming the woods as a kid. I was a typical child that loved being outdoors and I was reluctant when it was time to go in for school. As the end of high school drew near, college was not even a consideration as my thoughts were to get out of school and get a job outdoors! Which is what I did, working at a dairy farm for four years. As I continued to work at the farm, I began to realize that to succeed in today's work environment, a college degree is an important thing to have. Eventually I found a Thompson school view book and looked at the different degrees offered. Forestry really seemed like a degree that could work for me. Living and growing up in a forested area my whole life had spawned an appreciation of trees and a realization that forests were disappearing under the pressure of development. Also I had become an active maple syrup producer, tapping 130+/- trees every spring. The desire to learn more about trees and the proper management of them pushed me to apply for the Thompson School's Forest Technology Program. Going back to the classroom after four years was strange, to say the least, but within a few weeks I felt right at home among the other students. The class sizes are small, allowing the classes to feel more like a discussion than a lecture. Don Quigley and Matt Chagnon, the two professors, and Mike Simmons, the teacher's assistant, were always there to answer questions and help you with any problems. Since the Thompson School has fewer students than a typical college your faculty become more than just teachers over the course of the two years, they become friends that you could talk with about hobbies, what you did over the weekend and more. The Thompson School classes are mainly located in three buildings, Cole, Putnam and Barton, so you get to know not only your classmates in your program, but other students from other majors as well. I didn’t feel like I was just another student passing through, but that I was a part of the Thompson School itself. One of my favorite aspects of the forestry program is the amount of hands on learning. It is stated in promotional materials that for every hour of indoor class time, there are two hours of outdoor lab time and I can testify that this is actually true. This is a huge benefit because you don't just learn from a book, you learn how to do things out in the woods. Also there are many class trips taken all around the state to visit loggers, foresters, sawmills and landowners in their workplace. This provides an opportunity to meet the people who keep forestry alive in New Hampshire and allows the students to create relationships for the future. While at the Thompson School I was able to take advantage of some of the benefits offered by a University campus. I was a member of the UNH Woodsmen Team for the two years that I was at school. With this Sports Rec team I traveled around New England and New York, competing against other college teams in wood chopping and sawing events. In April of my senior year, I had the opportunity to represent UNH in the Stihl Timbersports Collegiate Challenge that airs on ESPN-U. Since graduation I have continued to pursue lumberjack sports, traveling as far as West Virginia to compete against some of the best in the country. Upon graduation in May of 2010, I was hired full time by Fort Mountain Companies, a full service forestry company owned by Jeff Eames, a Thompson School alum. Fort Mountain Companies is located in Allenstown, NH and provides forestry consultation, timber harvesting and transportation of forest products to landowners in the southern half of the state. A new and expanding division of the company is a log yard where we buy and sell logs. I had actually worked for this company previously, during my summer internship that is required between the two years of education at the Thompson School. Gaining a job with this company after graduation was one of the benefits of the internship experience, because not only did I acquire on the job experience, I also became a candidate for future employment. My daily work varies greatly which keeps things interesting. My main jobs include working with the company's licensed forester Patrick Kenney (also a Thompson School grad) marking and laying out timber sales, writing management plans and assisting landowners in making management decisions for their land. Another main component of my job includes managing the expanding log yard. My duties in the yard include scaling and grading hardwood and softwood logs, loading and unloading trucks transporting logs, selling veneer logs to buyers and managing the yard inventory. Every day I use skills that I learned at the Thompson School and I have also had the chance to introduce the company to the benefits of using GIS technology and we now use this mapping software for management plans, creating harvest maps and locating wetland crossings. I feel that a degree from the Thompson School is a strong benefit in the forestry world and the hands on knowledge learned during lab time allows you to move seamlessly into the workforce with minimal training. 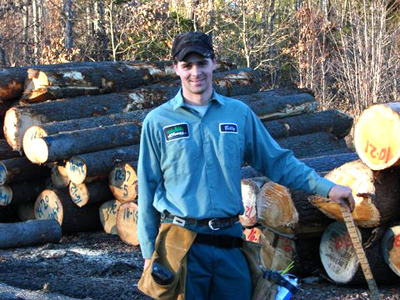 Forestry professionals in New Hampshire and around the Northeast know the reputation of Thompson School students and will often choose them over others because of their education and hands on learning.